After the financial collapse in 2008, it suddenly became very in vogue to talk about whether the US was going to become “Japan,” a country synonymous with horrible growth and horrible economic policy for years. The advantage that the US had was that it got to see the Japanese tragedy play out, and learn from Japan’s mistakes. Fortunately, Federal Reserve chairman Ben Bernanke followed Japan closely and was determined not to make the same errors. One of Japan’s biggest mistakes? It wasn’t nearly as aggressive as it needed to be, early on, in terms of monetary easing. It also engaged in premature fiscal austerity. The US has made ome austerity mistakes (though not much) but where the US really shines is in monetary policy. 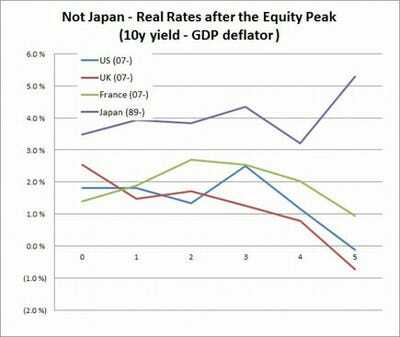 This chart from @pawelmorski on Twitter compares real interest rates in the West post crisis peak to Japan post-crisis. As you can see, in the subsequent years from the equity peak, US real rates fell aggressively. Japan’s fell a bit, and then perked back up. Japan eased up on the gas pedal way too early and the economy continues to pay for it (although it’s trying to compensate now).